Despicable Me appears in an aspect ratio of approximately 1.85:1 on this single-sided, dual-layered disc; the image has been enhanced for 16X9 sets. Given the restrictions of SD-DVD, the movie looked pretty good. For its format, sharpness looked positive. Softness did affect wider shots, but that was inevitable. Overall definition remained fairly solid. No issues with jaggies or shimmering occurred, and I saw no signs of edge haloes. Source flaws remained totally absent as well. Colors became a highlight. The movie enjoyed a broad palette, with a lot of purple at the core. A wide variety of other tones appeared as well, and all of them looked rich and dynamic. Blacks were dark and deep, and I thought shadows seemed smooth and clear. This was a very nice SD-DVD transfer. Though also not killer, the film’s Dolby Digital 5.1 soundtrack worked well. My only complaint connected to some of the action scenes, as they didn’t always boast the expected level of activity. For instance, when Gru chased Vector in their flying machines, the track seemed surprisingly restrained; the vehicles zipped around a bit but failed to take great advantage of the possibilities. A few extras accompany the film. First we find an audio commentary from directors Chris Renaud and Pierre Coffin; the Minions also occasionally show up to interrupt. The commentary covers cast and performances, animation and effects topics, character, prop and set design, audio and music, and story areas. During The World of Despicable Me, we get a 15-minute, 16-second show. It features Coffin, Renaud, screenwriters Ken Daurio and Cinco Paul, producers Chris Meledandri and Janet Healy, production designer Yarrow Cheney and actors Steve Carell, Miranda Cosgrove, Jason Segel, Russell Brand and Julie Andrews. “World” examines characters and story elements, set and gadget design, and other movie thoughts. While not unenjoyable, “World” exists as a general promotional featurette. This means it lacks much depth, so although it’s peppy and moderately engaging, it doesn’t tell us much. A play activity arrives with Gru’s Rocket Builder. It requires you to match landmarks to acquire rocket parts; do so and you win. It remains a minor diversion at best. Under A Global Effort, we learn a bit about the production. 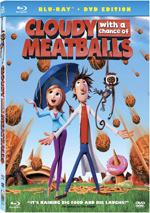 It goes for three minutes, 23 seconds and features Renaud, Coffin, Healy, Andrews, Meledandri, Cheney, Segel, actors Will Arnett and Jack McBrayer, and animation assistant production manager Joy Poirel. “Effort” looks at the international nature of the production and tells us about how that worked. It gives us a smattering of useful bits, but as with some of its siblings, it’s too brief. Under Game Previews, we discover two ads. These promote Despicable Me: The Game and Despicable Me: Minion Mania App. The disc opens with ads for Hop, Nanny McPhee Returns, the Back to the Future trilogy and The Little Engine That Could. No trailer for the Despicable Me film appears. 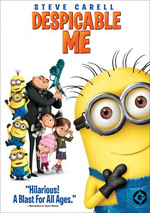 While I don’t view Despicable Me as a bad film, it definitely represents a disappointment. On the surface, the movie seems like it should be a witty adventure, but instead, it ends up as a vaguely dull effort with only occasional laughs. The DVD offers very good picture and audio along with a generally nice set of supplements. This is a reasonably enjoyable movie but not a memorable one.